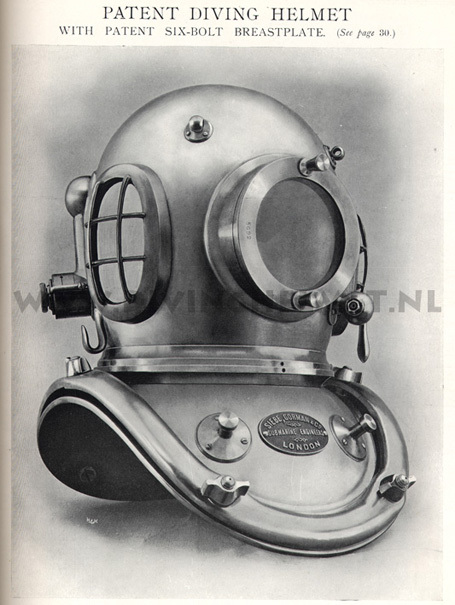 1945 Siebe, Gorman diving apparatus is adopted by the Dutch military. 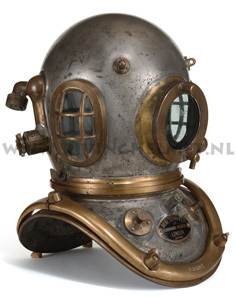 Commercial Dutch diving companies have been using Siebe, Gorman diving apparatus since the 19th century. 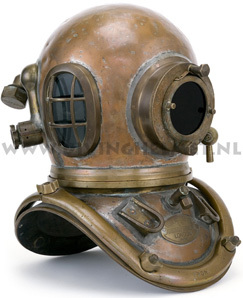 After WW2 the Dutch military started using surplus stocks of Siebe, Gorman apparatus with ‘Admiralty Pattern’ helmets. The Dutch military fostered close links with the British military during the war and much of the Dutch military hardware was sourced from Britain during and after the war. 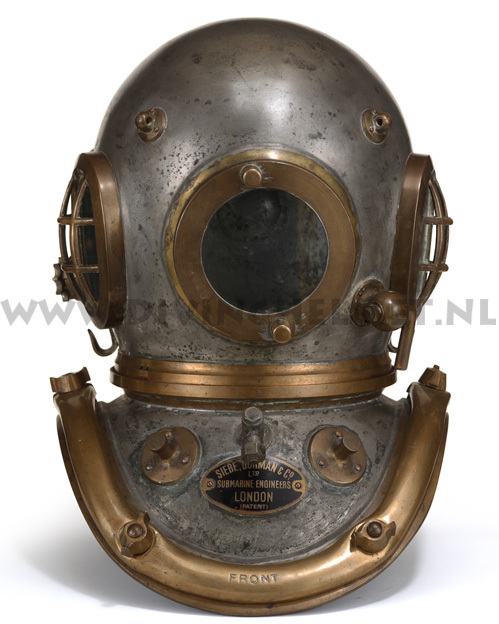 Therefore as Siebe, Gorman were diving apparatus suppliers to the British military, it seems reasonable that they would also supply the Dutch government, because of the close ties between the two countries forces. 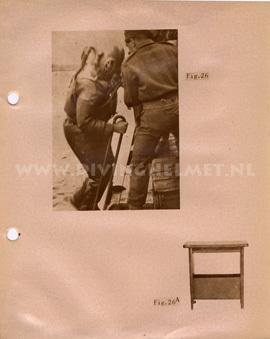 The scanned images below come from the first post-WW2 Dutch military diving manual and shows a standard ‘Admiralty Pattern’ 6-bolt diving helmet, with the associated apparatus. The manual illustrated above has the word ‘obsolete’ stamped on the cover and has other markings that show it was replaced in 1957. It is the only date I have seen which may indicate the time period when the Dutch military started using Siebe Gorman apparatus with ‘specific modifications’. 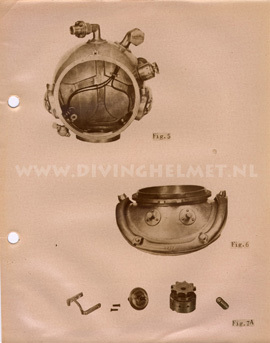 Using the standard German style of diving dress, the Dutch diving helmets were equipped with a bailout set incorporated into the front weight and attached to the breastplate using Draeger carbine hooks. 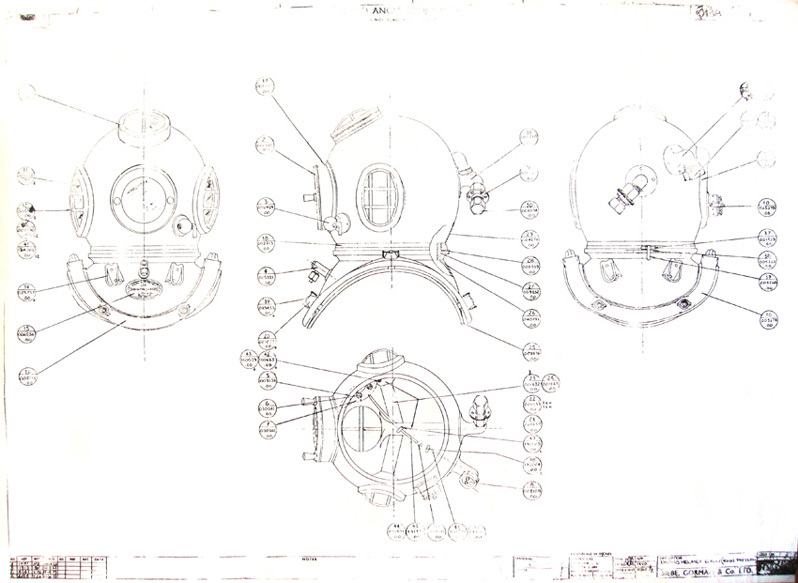 The Siebe, Gorman breastplate is modified by removing the original Siebe Gorman weight studs and adding Draeger eyes at the front and back of the helmet. On the front breastplate is a connection for a hose which comes from the front-weight bail-out tanks. 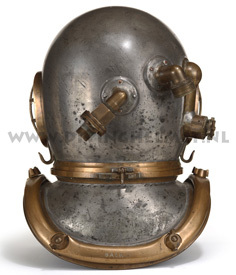 This modified apparatus became the new standard dress for the Dutch military and remained in service until about 1980. 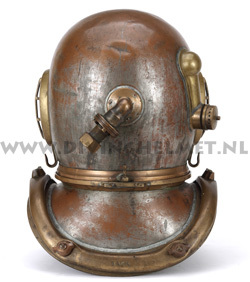 However this modified Siebe, Gorman helmet does differ slightly between the Dutch army and navy versions. The army version had ‘three lights’ (windows), while the navy version had ‘four lights’ (with the extra top-light). 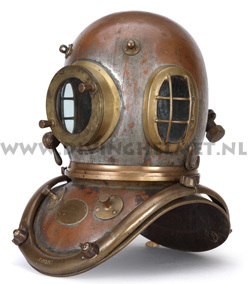 A top-light provides better visibility when working around ships, as the diver can also view upwards. 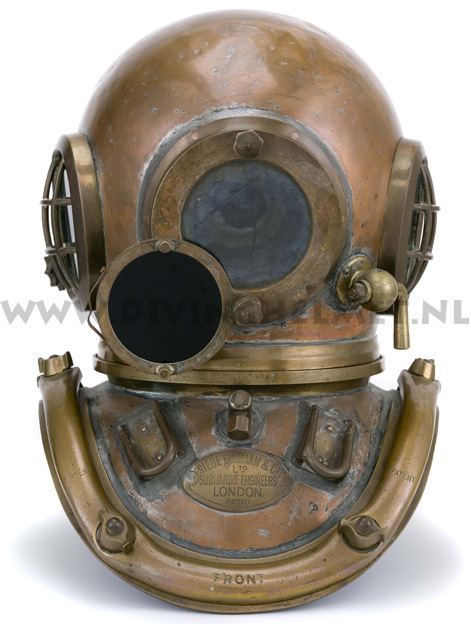 This style of helmet was initially modified in Holland, but later on, helmets were ordered ‘factory modified straight from Siebe, Gorman & Co. Ltd. 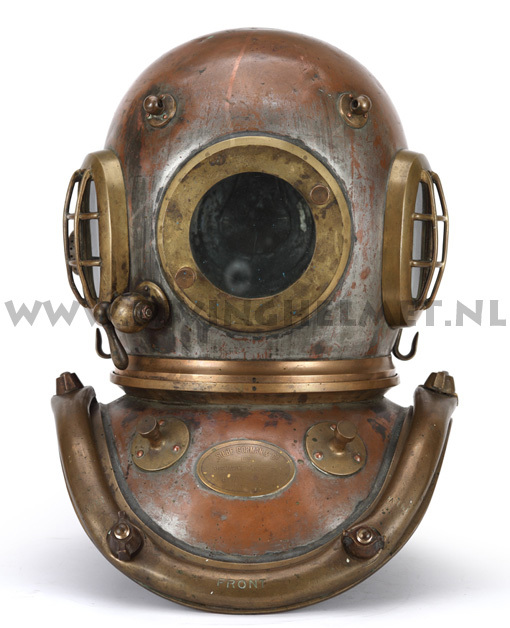 This model of helmet (of which I have factory drawings) was known as the ‘RNN Pattern helmet’; RNN standing for ‘Royal Netherlands Navy’. There may have been an equivalent ‘Royal Netherlands Army Pattern‘ helmet but I have no evidence of this to date. 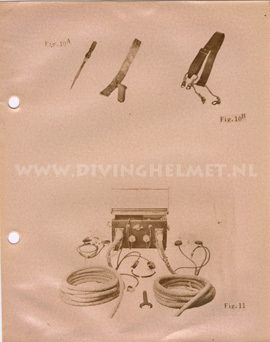 My first standard diving experience was undertaken using a Dutch army engineers diving helmet. I had joined the army in March 1983 at the age of 17 with the intention of learning to diver. 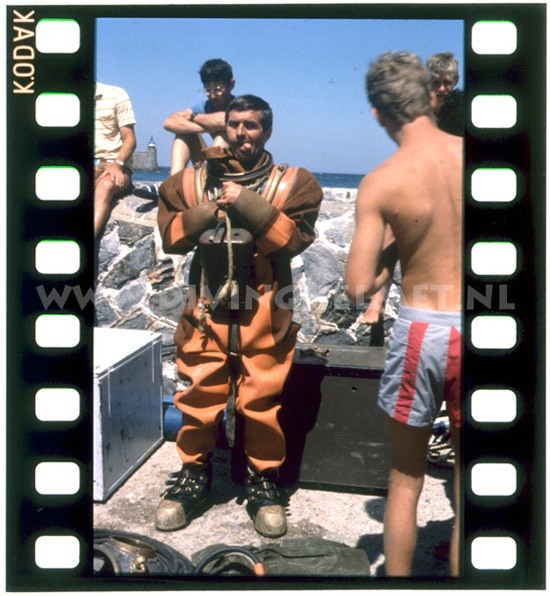 There had been no place for me at the ‘Rietveld’ Art Academy in Amsterdam where I wanted to go, but being ‘mad’ about diving, the army diver training seemed a good alternative. 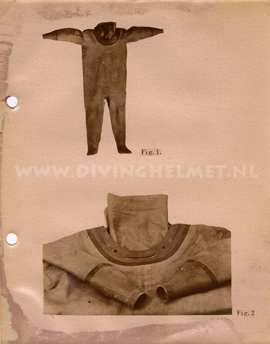 At my diving club in Amsterdam there was an army diver named ‘Meindert’ who had completed the army divers training. He seemed to be doing quite well: he worked all over the world and earned a good living. At the club he was well respected as a diver and having joined the club myself at the age of 15, I looked up to him as a role model. So instead of waiting at home for another year in a second attempt to get in to the Art Academy, I wrote a letter to the army and asked to be allowed to do my service earlier and if possible, to join the diver training. The army wrote back and told me that this was possible and that I would be allowed to apply for the diver training. I passed the basic physical tests and in the winter of 1983 I started two months of basic military training to be followed up with one year of service that was combined with special training. 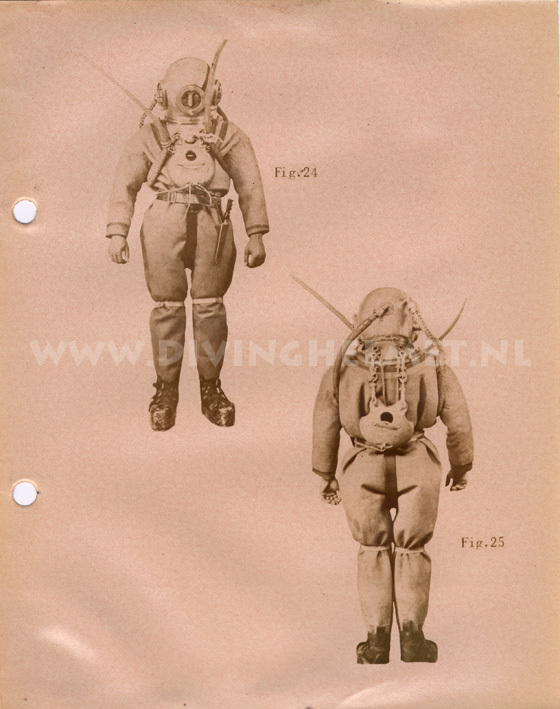 During the basic training, all specific tests to become a diver were carried out at the base. 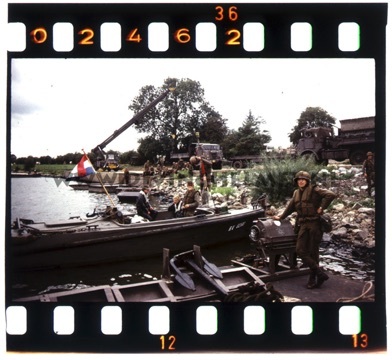 I was selected for the psychological tests at a military camp in ‘Hollandsche Rading’. I passed the psychological tests and this was followed by the demanding physical tests with the navy in ‘Den Helder’. However during the physical tests, the navy doctors discovered I had suffered a bad fever. I had probably ‘caught a cold’ during the basic military training from sleeping outside during winter time, walking though water up to my chin, followed by long marches in wet clothing as well as various other exercises. All this was combined with a steady lack of sleep. My diving test was cancelled immediately and I was sent back to the army base in the south with a letter from the angry navy doctors who complained about the fact that the army had sent them a candidate who was ill. I would not be able to become a military diver after all, which was a real set back. When calling home that same week I was told that my friend Meindert from the Amsterdam diving club was killed when he was working on a wreck in Newfoundland. The wreck was at a depth of 80 metres and he and his buddy were cutting holes in the side of it. While carrying out underwater cutting tasks, an explosive gas is formed and before using a cutting torch underwater, a diver needs to be sure that this gas has a way to escape out of a wreck. On the wreck, Meindert was doing some cutting, but someone had made a bad mistake and there was no way out of the wreck for the gas. Therefore after a while a large gas pocket formed and when the torch flame contacted the gas pocket there was a fatal explosion. Meindert was killed immediately and his buddy died shortly after reaching the surface. When I received the news from home, it made my own problems (e.g. being ill at the medical test and dropping out of the divers training) seem trivial and unimportant. I stayed in the same unit, not as a diver but as a ‘pontonnier’ instead (all divers are pontonniers but not all pontonniers are divers). I learned to handle all types of boats, qualified for my boat license, learned how to build bridges (to help advancing forces to cross rivers) and also how to blow them up (incase the army had to pull back across a river as defense). Shortly after I had left the army in 1984, my parents were visiting my grandfather in Utrecht as it was his birthday. While they were there, they noticed a large photograph of a Siebe, Gorman helmet on the front page of a local newspaper. 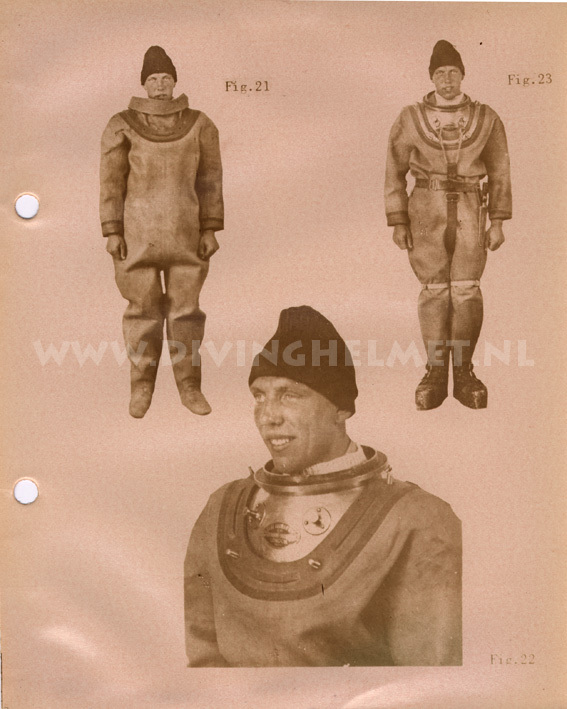 The photo and article was advertising the sale of MOD diving apparatus from my former army engineers unit. Knowing I was keen on anything to do with diving (books, patches, pins etc.) my parents bought the newspaper article home for me to read. The viewing date had already passed, but there was still time to bid. I had little money as I had only earned 300 euro’s per month during my 14 months in the army. Much of my money had been spent on beer and cigarettes which is fairly typical for a soldier. A diving club friend of mine named Frans once told me that if I had any good business ideas he would be keen to partner me in a worthwhile venture. So I phoned him and he seemed quite interested about the diving apparatus. 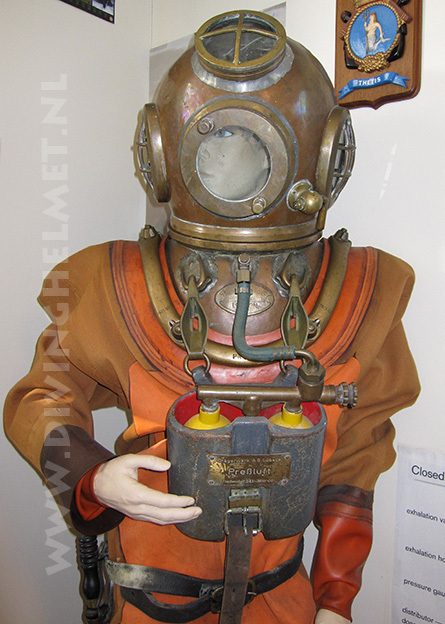 The next morning, I contacted the MOD site where the diving apparatus was being stored. I explained that I had just finished as an army engineer, and would it be possible to quickly view the equipment. 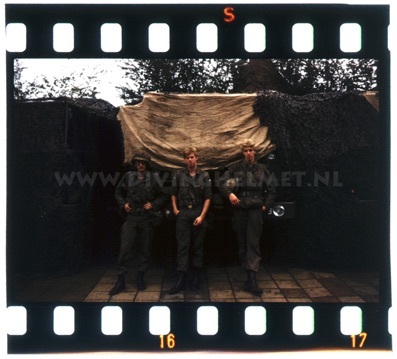 They said yes, so the next morning Frans and I drove to Soesterberg to have a look at the surplus stock. We bought three large lots of diving equipment which had to be moved from the army warehouses by ourselves. This was managed with the help of some diving club friends and the man who had shown us around the warehouse. In the end it took five journeys with two cars (plus trailers) to transport everything to my house. We had ‘no idea’ what we had bought and opening the cases of equipment was an exciting discovery. 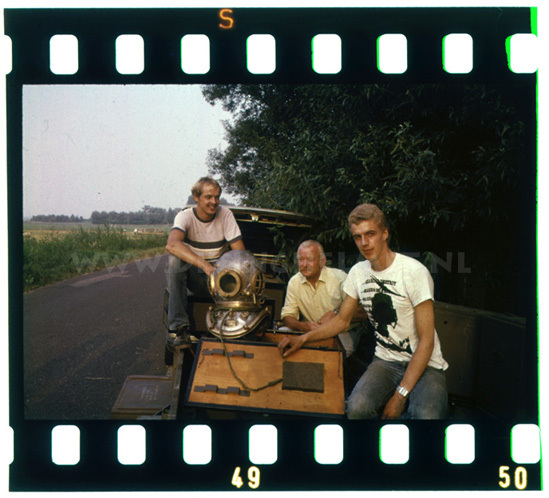 There was so much gear that I had to store a lot of it at my parents house, filled the garage of my neighbour ‘Piet’ (who was also a dive buddy at the club in Amsterdam) and Frans also took a lot home with him. 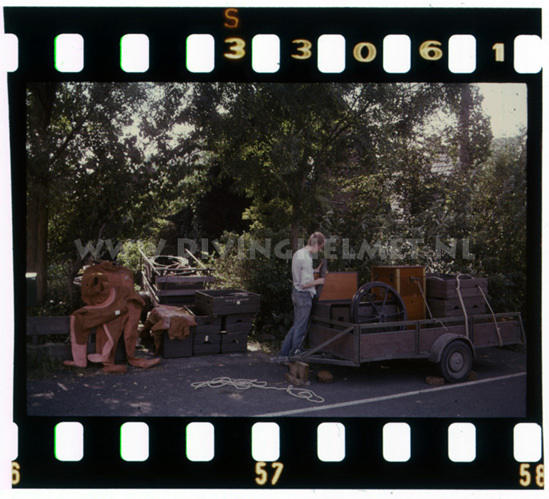 Summer 1984 Unpacking one of ten trailers with Siebe Gorman equipment at home. The helmets we bought were each packed in a wooden crate. At the left Frans, middle Piet and myself at the right. 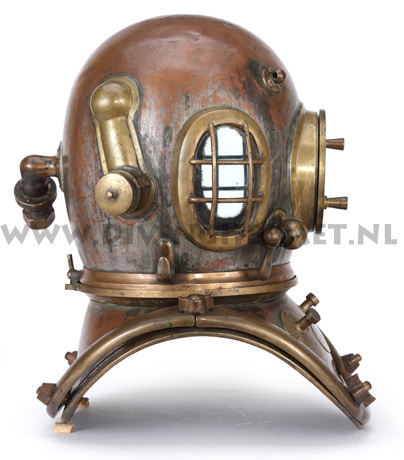 The next day our phones started to ring with calls from the other bidders, when they realized that it was us who had purchased the diving apparatus. Many were interested in buying various items from us. As I had borrowed the purchase money from my parents I needed to produce a business plan to pay them back, plus make a profit on my share of the apparatus. As I had no real idea as to the value of our apparatus I wrote to several dealers for prices. I even wrote to Siebe, Gorman at Cwmbran in Wales to see if they could provide a price list. 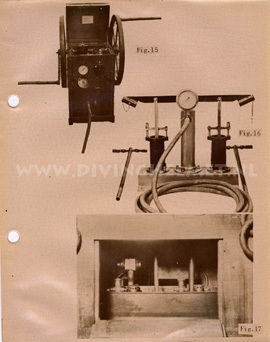 Much of the apparatus was brand new and still had the factory labels attached to the items. However, there was not even a single reply from the dealers or Siebe, Gorman. 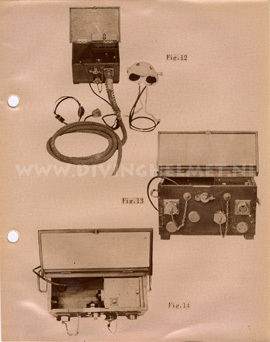 In the end Frans and I decided to keep one complete set of diving apparatus each and to sell the rest. The rest of the apparatus sold quite readily at a price of 2,000 euro for the complete standard dress and an extra 1,200 euro for a pump in new condition. Frans soon sold all his equipment and ended up with a small surplus profit. 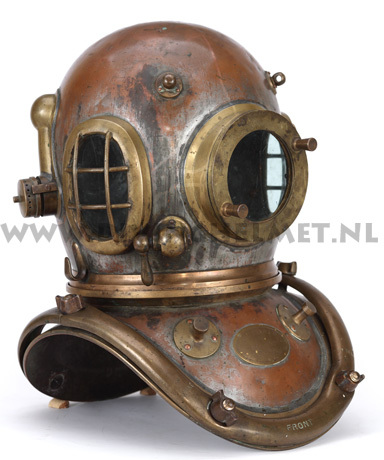 Instead, I started a business and advertised my apparatus for hire, or to take people for half hour dives in the antique apparatus at a cost of 12 euro (25 guilders in 1984) per dive. 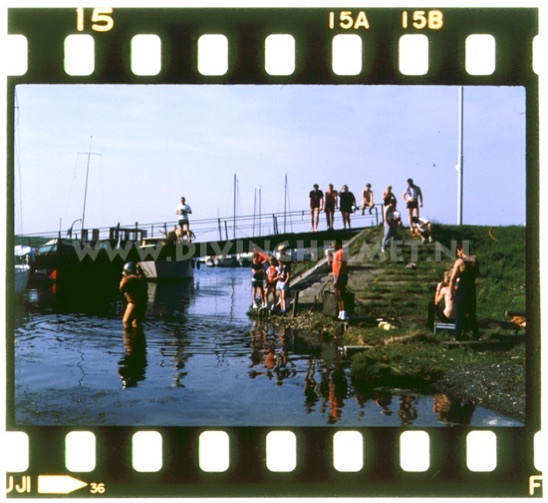 I spent three years in Holland diving my ‘standard’ apparatus which included giving demonstrations, opening new swimming pools, taking underwater photographs and letting sports divers have a go just for fun. In 1987 I moved to the South of France where I continued doing the same type of thing. The helmet I kept for myself was an old Siebe Gorman ‘Admiralty Pattern B’ helmet which had been modified for the dutch army. 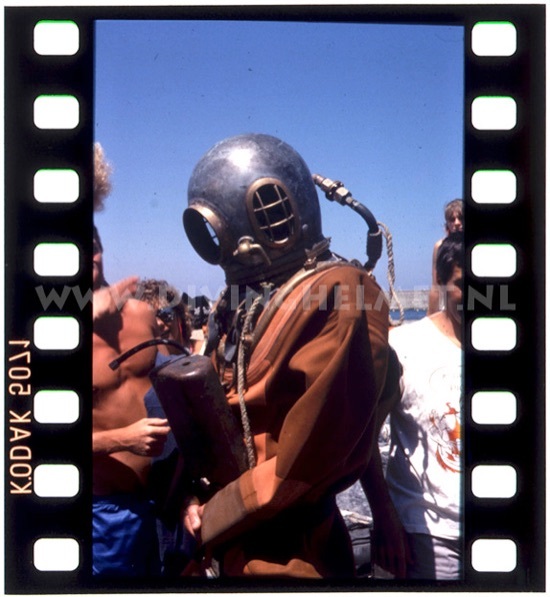 Diving with customers in the South of Holland somewhere between 1985 and 1987. 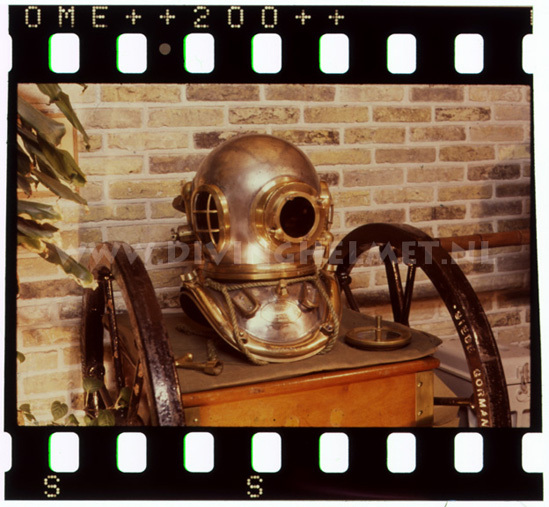 In 1987, the year that I lived in France, I had a ‘few hundred’ customers who dived using my Siebe, Gorman apparatus. During that year I dived with diving clubs in Cerbere, Banyuls sur Mer, Collioure and in Argeles sur Mer. I had a great season but did not earn enough money to stay there all winter and unfortunately I had to return to Holland. 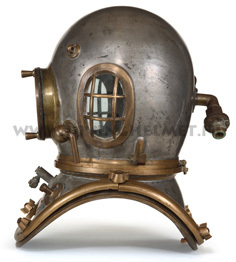 By 1994 I had become a professional dealer of diving apparatus and travelled widely throughout Europe. Through a client in France, I re-established contact with Bernard, one of my ex-customers who lived in Rennes and who had dived my Siebe, Gorman apparatus back in 1987. 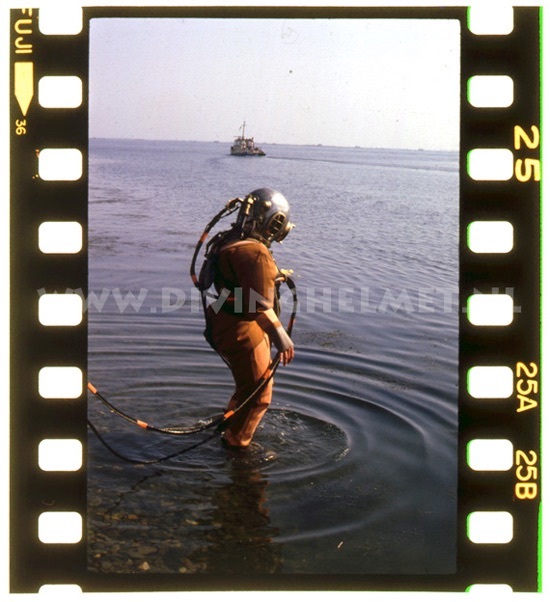 He kindly copied some slide photographs for me that he had taken of his diving experience using my gear. 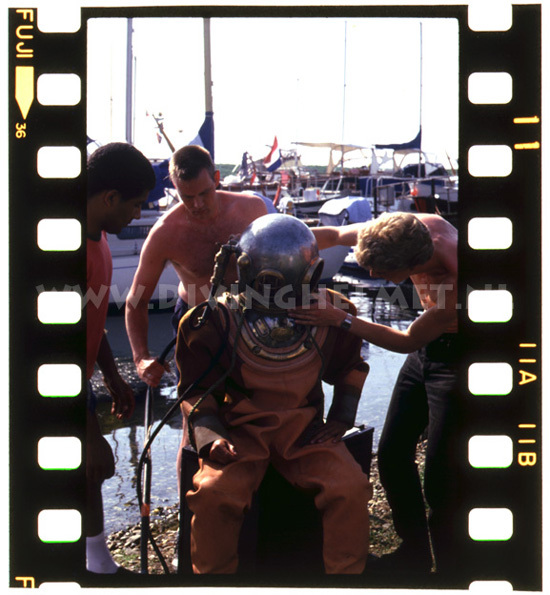 1987 ‘Babteme Pieds-Lourds’ diving the ‘hard hat’ in France. Because the 6-bolt helmet was produced during most of the 20th century I shall end the Siebe, Gorman & Co. Ltd chapter with an account of this helmet which was introduced into service around 1900. 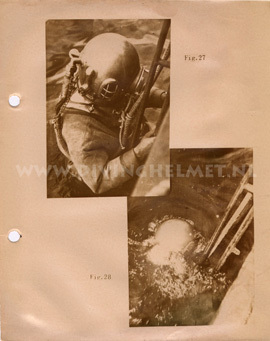 The 6-bolt helmet was used by several navies around the world and was still being used in the 1980s, especially by the Dutch forces. 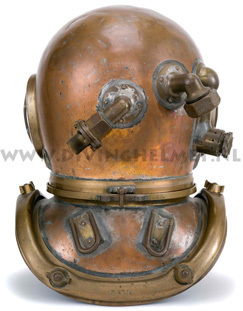 After these helmets became officially obsolete in the Dutch military in 1984, my passion for old diving apparatus then began. I include a brief personal story in this chapter. Before 1900 the British Admiralty (Navy) and British Royal Engineers used the ‘standard’ Siebe, Gorman & Co. 12-bolt helmets. Later on they also adopted the 6-bolt helmet. The 12-bolt helmet was called the ‘British Admiralty Pattern A’ helmet; the 6-bolt helmet was called the ‘British Admiralty Pattern B‘ helmet. 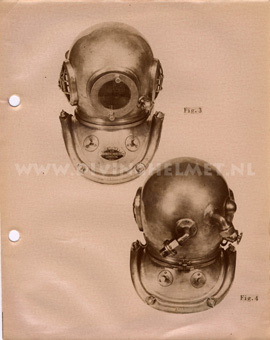 Later on, when the 12-bolt helmet was no longer used with the Admiralty, the 6-bolt helmet became simply known as the ‘Admiralty Pattern’ helmet. 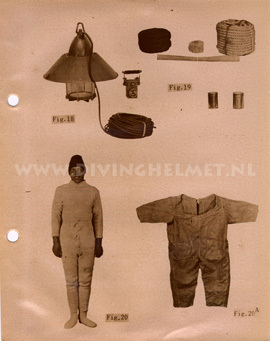 The first Siebe, Gorman catalogue (from my archive) in which a 6-bolt helmet is shown can be seen in the 1905 edition. It depicts the helmet with a cast company badge with the ‘Siebe, Gorman & Co.’ name on it. I believe this dates the introduction of this helmet to about 1900 - 1904. 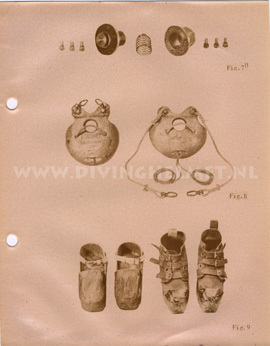 A set of weights from a Dutch military helmet. The front-weight is clearly inspired by the pre-1942 German Draeger design, but is made in England by Siebe, Gorman & Co. Ltd. The back-weight is a standard type Siebe, Gorman weight, but instead it has the Draeger carbine hooks and an attachment for a Draeger-style jockstrap. An ‘Admiralty Pattern’ helmet with first style ‘flat’ company badge. 1904. Siebe, Gorman & Co. Ltd.